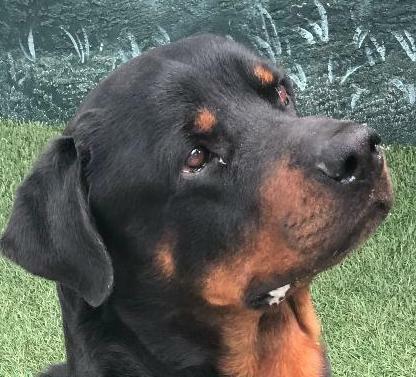 Riley has a sad story, he was dumped in a shelter that doesn't adopt out Rottweilers to the public, just one day after being adopted in another shelter that is 50 miles away. Not his fault, the person who adopted him, didn't verify first with the apartment management where he lives, if a dog of Riley's sizes will be permitted. That is is how, he found himself all over again, alone, scared, confused in a strange, noisy and cold place. Although all of he has been thru, Riley is a happy, sweet, mellow and playful boy. He will work for a piece of chicken, not much interest for toys. He is tall and needs to put a little bit of weight, but not too much. When he sees you, he acts like you were his friend for his entire life, warms up immediately to you, wants attention and affection. 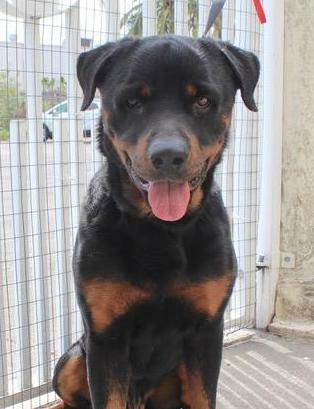 We estimate that Riley is young, probably 3 to 4 years old, at the shelter he was tested with cats and didn't show any type of aggression or being overly interested on them, the same behavior was observed when he was walked by other dogs’ kennels, he just mind his business. 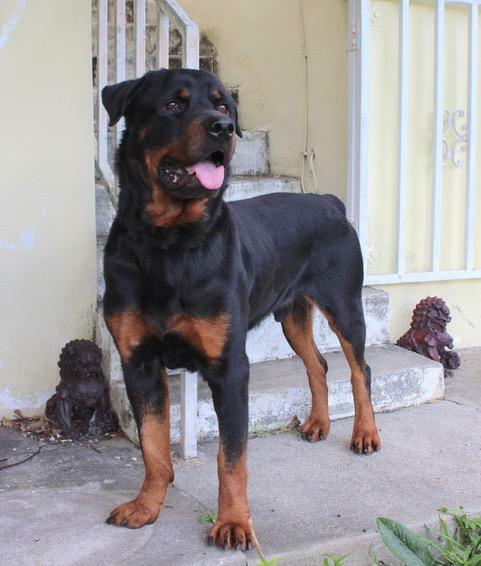 Because of his size, we prefer a family with older kids, he will be the perfect companion for long walks and hikes. Riley came to GGARR from Polk County AS in Winter Haven when he was found stray. 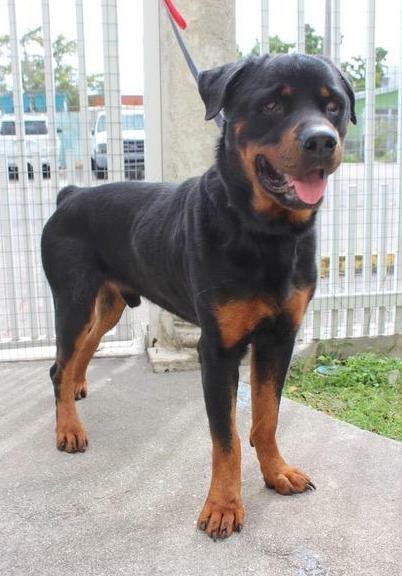 The Shelter contacted our GGARR Rescue Coordinator Diana Alcazar, sent pictures and Grace told Diana that he needed to be evaluated, so Diana drove from Lutz to Winter Haven and found a lovely young Rottie and pulled him to safety. Riley was Heart Worm positive and had to come to Mueller Animal Hospital to get that his Heart Worm treatment done. 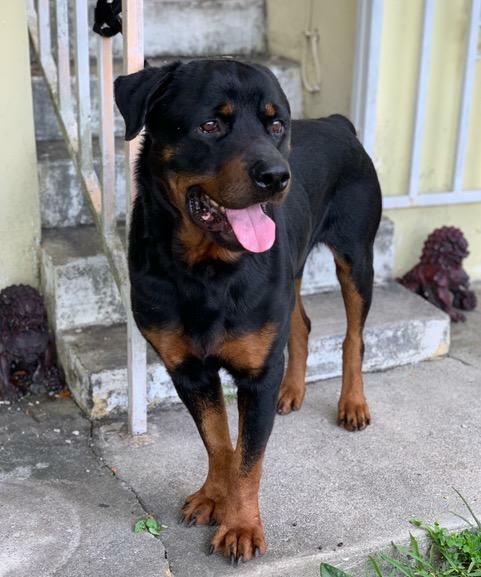 GGARR contacted our Transporter Jim Dwyer and he drove Riley from the Shelter to Comfort Kennel in Hialeah for his quarantine before going to Mueller. 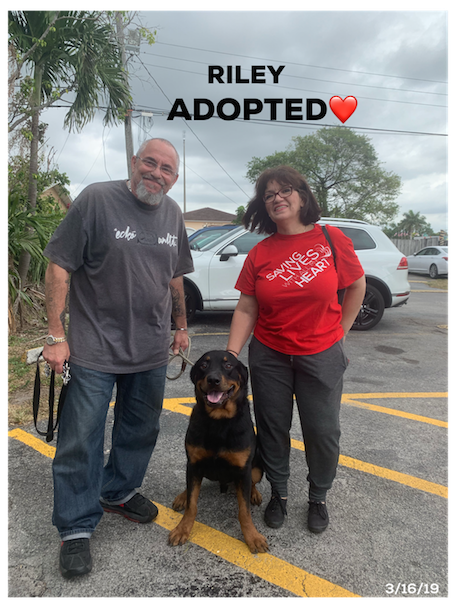 In the meantime, the Eichenholtz family who adopted Rubi from us on January 12, wanted to get a companion for Rubi and went to meet Riley at Comfort Kennel, fell in love with him and were willing to wait for his treatment. I drove Riley from Comfort Kennel to Mueller Animal Hospital and our dear Dr. Emilio worked with him and completed his treatment. 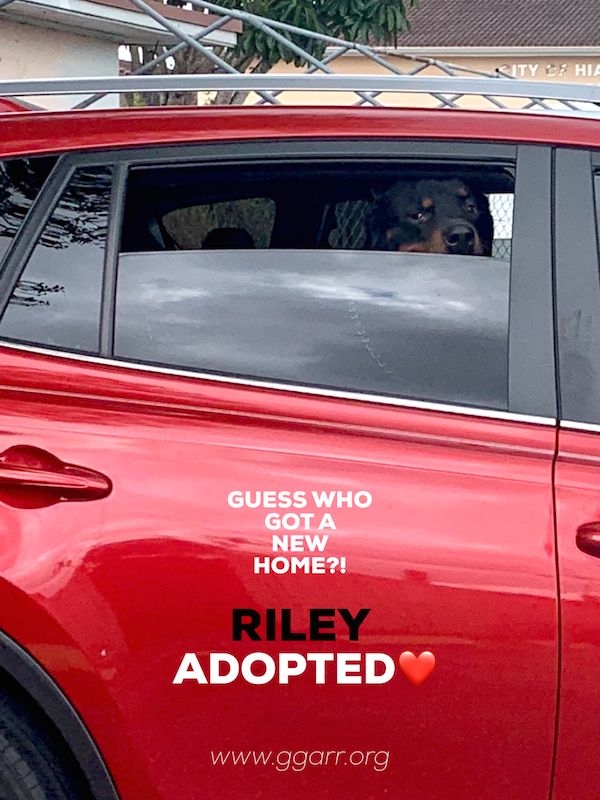 Yesterday, Bruce and his wife Mirta went to Mueller to adopt Riley. Our Miami Rescue Coordinator Luciana Pinto was at Mueller with me. She already knew this great family so she loved to show Riley again to them. 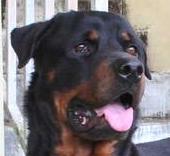 Let me tell you all that Riley is extremely loving, friendly and very handsome. So yesterday my dear friends was Riley's day.